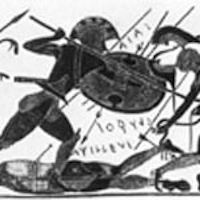 Jonathon Burgess, in a 1995 article titled "Achilles' Heel: The Death of Achilles in Ancient Myth", uses evidence from ancient art and literature to argue that in earlier myth Achilles was probably killed outside the walls of Troy with two arrows. The first hit his foot or ankle, crippling him and taking away his legendary speed (Achilles is typically referred to as swift-footed),2 while the second killed him. In the later Roman myth, Paris shot him in the heel inside the temple of Apollo. Homer does not portray the death of Achilles in the Iliad, but the tragic poets refer to his death at Troy. In Sophocles' Ajax, Ajax's disappointment over not receiving the armor of Achilles motivates him to seek the deaths of Agamemnon, Menelaus and Odysseus, and in the Philoctetes, Odysseus tells Neoptolemus to tell Philoctetes he is deserting because the Greeks refused to give him his father's armor. In Euripides' Hecuba, the virgin Polyxena is sacrificed at the tomb of Achilles soon before the Argives leave Troy. 1 Apollonius, The Voyage of the Argo, 4.869-872. "[Achilles] was a baby then, and in the middle of the night [Thetis] used to surround her mortal child with fire and every day anoint his tender flesh with ambrosia, to make him immortal and save him from the horrors of old age. One night, Peleus, leaping out of bed, saw his boy gasping in the flames and gave a terrible cry. It was a foolish thing to do. Thetis heard, and snatching up the child threw him screaming on the floor. Then passing out of the house, light as a dream and insubstantial as air, she plunged into the sea. She was mortally offended and never returned." E. V. Rieu translation. 2 The ankle injury to Patriots' tight end Ron Gronkowski before Superbowl XLVI in 2012 is a contemporary example of how taking away a hero's speed can make him vulnerable. 3 Hom. Il. 18. 100. Lombardo translation. Lattimore translates the lines: "Then I must lose you soon, my child, by what you are saying, since it is decreed your death must come soon after Hektor's." 4 Homer, Iliad, 22, 397. Stanley Lombardo translation. The Western Gate is the Scaean gate. 5 Homer, Odyssey, 24, 38, Fagles translation.